When I first started playing Destiny last year, I enjoyed my time with it but more often-than-not, I was let down by the experience. In the weeks leading up to Destiny 2.0 and the new DLC, The Taken King, I found myself getting excited to play Destiny again. Perhaps this would finally be the co-op shooter experience for which I was looking. While it still has its flaws, I can confidently say that it comes pretty close to being just that. I’m going to gloss over any in-depth listing of all the changes that have been made to the game recently - you can go through our recent news posts on the game and Bungie’s blog posts for that - and instead focus on what those changes mean and what The Taken King brings. Ultimately, what the new changes and new additions to the game boil down to is this: you, as a player, are now engaged with this world/universe that Bungie has created. Throughout the game’s initial year, I was always left feeling like my actions didn’t really matter; I was just being shuffled through in order to get to the end-game content, which required such a dedication that it almost wasn’t worth it. You were barely an observer of the things that came before - with information gleaned from what you saw in the world around you and what you read in the (separate) Grimoire - and a confused participant in the things that were going on currently. This was disappointing as those were some rather interesting things. An entire race of robots had/have the ability to manipulate time and space and you raided their vault in an attempt to curb this. The necrotic/insect-like Hive woke a demigod to fight you. But all of that was presented with such indifference and a lack of any particular context that it always felt as if the only real goal was to get whatever new loot was available. 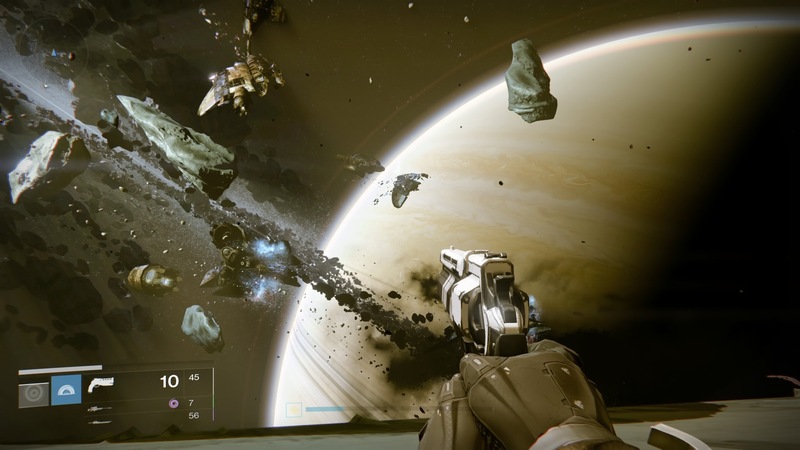 In The Taken King, the invasion of Oryx and his Taken (a new enemy that is composed of re-skinned and re-tooled Fallen, Hive, Vex, and Cabal) has an impact on the world around you. The Taken will randomly invade areas in patrols; they will appear in the familiar Strikes of yore (when participating in the Strike Playlists). Your actions (killing Crota) have lead to a world that is different now than it was a year ago. Not just for the Vanguard, either; the Fallen, Vex, and Cabal are all responding to this new threat. The full impact of these changes may not be realized until the planned DLC for this year gets released, but it is utterly refreshing to be able to now live in the world of Destiny and see what will happen next. Part of being a part of the world is discovering its secrets. The Taken King comes loaded with content that is waiting to be discovered, particularly within the new area, the Hive Dreadnought. For instance, you may wander into a little cave and notice there is a strange green aura filling your screen. Wait in that cave long enough, and you’re suddenly given a debuff titled “Scent of the Worm.” But what does that do? The answer lies within the same area if you’re able to successfully cross a chasm that has hidden platforms, which can be briefly seen when you scan with your Ghost. From what I’ve seen thus far, that is just the tip of the iceberg as well. Players are discovering new secrets, including bonus missions that are hidden WITHIN other missions, every day. If comments could be dropped on the ground, then I would say that Destiny has been taking some lessons from Dark Souls. Regardless, completing the story of The Taken King is only the beginning of the journey. Vendors and NPCs in the Tower will now give quests when certain criteria are met, such as completing certain missions or randomly discovering some special item while out on patrols, and great rewards await those who are diligent enough to pursue all possibilities. Page created in 0.3085 seconds.